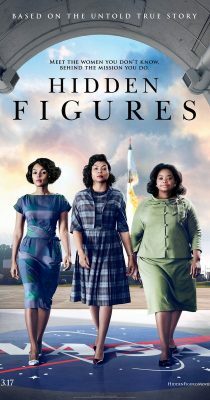 (02.26.2017) By Liv Minshall — Hidden Figures is a film about three underappreciated female African American mathematicians behind NASA’s great Space Race in the early 1960s. Taraji P. Henson, Octavia Spencer and Janella Monae star as Katherine G. Johnson, Dorothy Vaughn, and Mary Jackson, respectively. The movie primarily follows Johnson (Henson) as she is (dis)placed into the all-white, male dominated world of NASA’s Space Task Group. There she fights to prove herself as the best computer programmer amidst many problems, including the seemingly trivial issue of being able to use the bathroom. The film also follows a capable administrator, Dorothy Vaughn (Spencer), and the struggle she faces climbing the social ladder and being held back at every turn by her white supervisor. This role earned Spencer an Oscar nomination for Best Actress in a Supporting Role. This feel-good drama is already the highest-grossing film featuring African-American actresses, boasting $155 million to date. The cast also advertises many other familiar names, including stars like Kevin Costner, Kirsten Dunst, and Jim Parsons. There are many moments in this movie that had me literally cheering at the screen. A personal favorite is when Jackson (Monae) goes to court to earn her seat in a class taught in an all-white high school in order to earn her promotion as NASA’s first female, black engineer. Hidden Figures was by far, the most refreshing movie to come out of 2016. It is smart, funny, and the plot moves itself without any unnecessary conflict. The film deals with the topic of segregation, to be frank. It is not a flashy movie, but it doesn’t need to be, as the story tells itself in a very wonderful and organic way. This movie is first and foremost an empowering film about girls succeeding through their own hard work. It presents real and mature themes but can be enjoyed by the whole family. I give Hidden Figures a 5/5.